They say time flies when you’re having fun; so it really should have dragged over the last few years through the deepest recession in living memory. 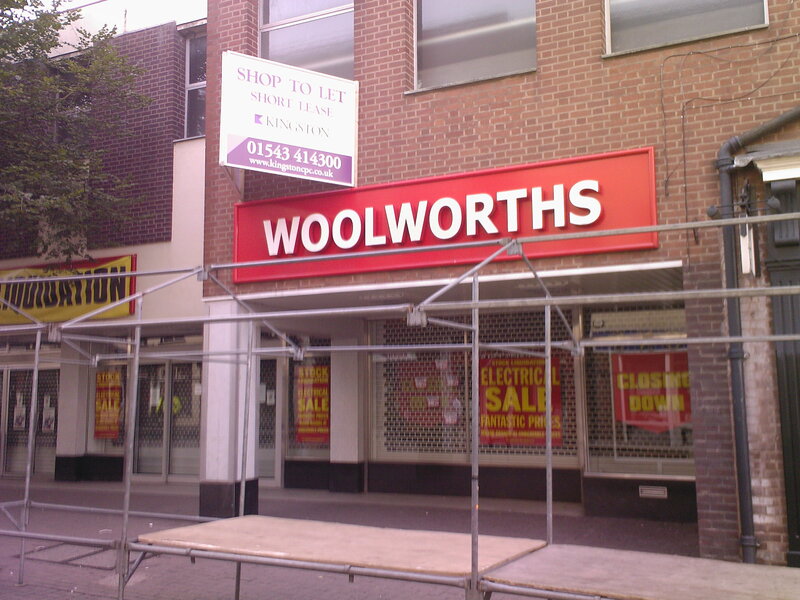 But it really doesn’t seem like five years (FIVE YEARS) this week since Woolworth shut its doors. But, yes, Woolworths went into administration on the 26th November 2008. When Woolworths shut up shop, there was an almost national outpouring of grief. How would we survive? As the UK’s eighth largest retailer, with £2 billion of sales in 2008, Woolworths was a significant business (#1 in sweets and chocolates, #2 in entertainment and toys, #4 in homewares and #5 in children’s clothes), still attracting many customers, and there was real shock, upset and anger for many, not least the employees. Some sought to carry on the name (Shop Direct purchased the rights to the name and trade online as Woolworths.co.uk), the brands (Shop Direct also bought Ladybird, Home Retail (Argos) bought Chad Valley) or the approach (e.g. the copy-cat Alworths). Others though, simply expanded their business into the physical and/or market space Woolworths had occupied. Not all of Woolworths £2 billion per annum sales have been recouped by the competition, but there is no doubt the failure of Woolworths provided an opportunity for others. The loss of Woolies produced a physical void on the high street (now mainly filled in) but also, as so clearly seen in the press at the time, an emotional void. Woolworths was not a failure or signifier due to the recession, but rather had been a business a long time in its death throes. And the grief really for many customers was a reflection of their nostalgia and not the reality of their behaviours, as the figures above suggest. For the employees of course it was a far different and far more bitter story. The indefatigable Graham Soult has been keeping the flame/memory of old Woolies stores (mainly but not only in the North East) alive and has produced some fascinating images and details of previous stores and locations (@soult is worth following for mentions of Woolies and old stores everywhere – amongst other things). And while the hard-headed analyst in me says so what do you expect if you lose 70% of your customer base, the romantic does hark back to my memories and nostalgia for Woolies in Bridgend and Cardiff – and perhaps the certainty they embodied (bit odd really given they only arrived here in 1909). Maybe it was simply the floor, the smell and the pick’n’mix? But is that pull of the past going out of fashion? If, and let’s not hope so, say Poundland collapsed (and Poundland is what Woolies needed to become more like, as I’ve said before), would we be collecting and swapping old pictures and memories of their old stores and shops? I somehow doubt so (unless you’re a retail academic perhaps!). And that’s the Wonder of Woolies. This entry was posted in Closure, Historic Shops, Pound Shops, Retail History, Woolworths and tagged Closure, History, Nostalgia, Woolworths. Bookmark the permalink. The declining footfall might have been overcome but for two other factors: the simple lack of understanding of a changing market place, combined with buying patterns and volumes that reflected where they had been rather than where they were going. The demerger from Kingfisher in 2001 ought to have provided the new management with the opportunity to reflect – Kingfisher were offloading! However, it seems that there was more of the same underlying strategy. The focus on expansion into the Big W format and refurbishment of stores in the largest of town centres (their so-called city stores) is clear evidence that they were unaware that their prime market was where they were in effect the anchor store in a small to moderate sized town (what they called local and heartland). Most market towns relied on their Woolies and the firm was repaid by a generally loyal and returning customer base, but instead they spent money reacting to the business plans of those they deemed rivals rather than creating a unique offer. In 2008 I personally shut down stores in several market towns and the effect during the process on the remainder of the town was completely different to that experienced in larger towns where it was clear Woolies would not have been missed. I maintain that the final blow, the killer stroke, was that they simply ran out of cash – because they had failed to clear out unsalable stock at the end of a good many seasons, instead it was shipped to stores without a strategy for clearing and with next to no reduction. Some stock, as much as five or six years old, was packed so tightly into the stock-rooms it was difficult to walk between the aisles. In my forty odd years in retailing I have always believed that cash is king – you can derive profits in the long-term but if you do not create cash-flow to meet your short-term obligations then you will die! Their cash-flow was in their dead stock – they died along with it. Interesting photograph attached to the piece – not one from 2008 though, I think. The closing signage for the was quite different! Your points are well made. The photo is of Lichfield if I remember correctly and it was in the summer, so not of the December closure of the chain as a whole.